Why Is Winter Season A “Colds Season”? Colds are not caused by the winter breeze or the snowballs our children play with. Respiratory illnesses are brought about by viruses and bacteria which can be passed on from one person to another. Though we can catch a cold or any other respiratory tract infection anytime of the year, it has been a usual trend that the incidence rate for these illnesses seems to peak during the winter season. Why is that so? Exposure to low environmental temperature lowers the core temperature of the body. Inhalation of cold air makes the blood vessels in the respiratory tract constrict or narrow down. Extremely cold weather may cause “cold stress”. These factors may negatively affect the normal defenses of the respiratory tract, lowering the immune system function which makes a person more vulnerable to catch an infection. Another contributory factor is that children are most likely to stay indoors during this time. When a family member catches a virus or bacteria, he/she can carry it home and all the rest, especially young ones, are at risk of getting infected as well. The same principle holds true with enclosed classrooms and workplaces as they become a conducive environment for the spread of infection. According to the Centers for Disease Control and Prevention, common colds are a major reason of absences in schools (for kids) and at work (for adults). In fact, an average adult can get infected around 2 to 3 times a year and young children can even have more incidences. Since it is caused by a virus, there is no treatment to drive the cold away. Common colds are usually self- limiting, you’ll just need to offer your child plenty of fluids and enough rest. In most cases, a healthy body recovers in 7 to 10 days. However, those with underlying conditions or very young infants are at risk of getting more serious complications like pneumonia. Some parents may offer over-the-counter medications for the relief of symptoms, but for very young children, especially infants, it is usually safer to have them first checked by a pediatrician prior to giving them any medications. Flu resembles cold-like symptoms but tend to be more severe in nature. The symptoms are usually accompanied by fever, chills, extreme body malaise and sometimes, it also affects the gastrointestinal tract giving rise to symptoms like vomiting, diarrhea, and stomachache. Flu is a vaccine-preventable disease. Ask your pediatrician about the availability of flu vaccine to protect not only your child but also your whole family from the devastating effects of flu. The Respiratory Syncytial Virus or RSV infections are often mild, with symptoms similar to that of common colds. However, it is one of the most prevalent causes of serious respiratory tract infections among infants with pneumonia (infection of the lungs) and bronchiolitis (inflammation of the small airways). Being a viral infection, RSV may go away on its own within two weeks or less. Healthy individuals are able to manage the symptoms on their own, however, infants (especially those under 6 months of age) need to seek prompt medical attention for appropriate management. Keeping your child hydrated is also a must. Symptoms of sinusitis are usually manageable from home and may fade away within two to three weeks. Over-the-counter medications for pain relief and nasal decongestants often ease away the symptoms. Saline solutions may be used to clean the nose. However, prior to giving these medications to young children and infants, it is always best to bring them to the doctor to determine whether they really have a sinus infection or not. Warm compress may also help relieve the pain and tenderness around the affected area. Asthma is a chronic condition which involves the inflammation of the bronchial tubes which serves as the passageway of air coming in and out of the lungs. Asthma attacks happen when a certain “trigger” enters the airways and cause an inflammatory response. Triggers include dust, pollens, strong scent, an inhaled powder, smoke or any other particle that a person may be allergic to. Asthma can also be triggered by food, a heavy physical activity, or a recent respiratory tract infection. Asthma has a genetic predisposition, meaning if the condition runs in your family, it is likely your child will develop asthma, too. There is no cure for asthma, but there is a treatment plan that can help alleviate the symptoms of corticosteroid therapy and preventive plan to avoid the triggers. If your child is previously diagnosed with asthma and is currently showing signs of a respiratory tract infection, then you must bring him/her to the doctor for an early intervention. A sore throat is usually prevalent during the winter months. It is characterized by itchiness and pain on the linings of the throat. A sore throat is most often associated with tonsillitis, the inflammation of the tonsils (small glands situated at the back of the throat). A sore throat may be caused by a viral or bacterial infection. A sore throat can be very irritating and may affect a child’s appetite. If the tonsils are too swollen and the infection got worse, it may also cause a high fever (may reach up to 39 degrees Celsius). Though a sore throat is manageable most of the time, children with high fever and difficulty in feeding may need to seek medical attention promptly. Sore throat of bacterial origin will need antibiotic therapy for the fast recovery of the child. 1. Avoid bringing your kids to crowded places. If possible, leave young children at home if you’re going to public places where there are a lot of people who can be potential sources of a virus or bacteria. 2. Offer enough fluids and good nutrition. Disease-causing microorganisms are everywhere. The best way to prevent your children from getting sick is to keep them healthy. Having enough immune defenses, viruses and bacteria will find it hard to invade their bodies. 3. Practice proper hand washing. Did you know that certain respiratory diseases spread through hand-shaking or even by simply touching a contaminated doorknob? Hence, hand washing is one of the best ways to prevent the spread of diseases. Practice proper hand washing technique, as per WHO guidelines, and teach this to your young ones. Proper hand washing will take finishing the “Happy Birthday Song” twice. Rub soap into your hands until it forms a full lather. Scrub your hands together palm to palm with fingers interlaced. Scrub the right palm on the left dorsum the alternately on the right dorsum. Interlock your fingers and scrub the nail tips on the opposite palm. Rub each finger in a rotational manner. Wash the faucet or use a paper towel to turn it off. 4. Avoid the spread of diseases. If you suspect that you have symptoms of a respiratory infection, take necessary precaution to avoid spreading it in your home. Avoid having close contact with infants and young kids. This includes kissing or hugging your kids, if possible. Don’t worry because it is just a temporary preventive measure and you can always cuddle them by the time you fully recover. Make use of disposable masks to cover your nose and mouth. Dispose your used paper towels, tissues or masks properly into a closed garbage bin. Wash your hands before and after handling things around the house. 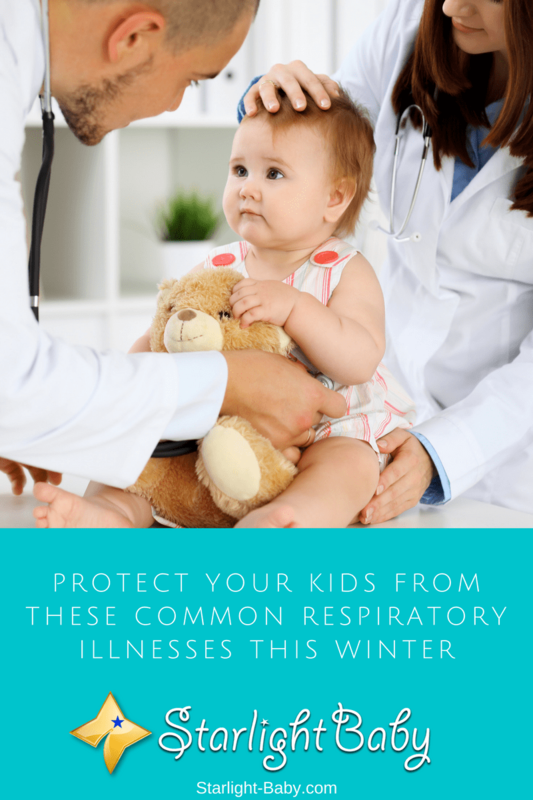 Winter respiratory illnesses are common but they can be prevented and managed to keep your children healthy the entire cold season. The article talks about the general information and tips to help you manage some of the most common respiratory illnesses from home. However, if symptoms persist, never hesitate to pay your pediatrician a visit. So far everything is going well for our baby. We take him outdoors only when there is sunshine, otherwise, we keep him inside bundled with clothes. We also use room heaters. In the last two cold months, the baby developed cold a couple of times, however, thankfully we did not have to go to the doctor because home remedies worked. Winter season is always a challenging period for both adults and children, but it’s much on toddlers and babies because of how tender their body and skin is. They cannot withstand too much without catching cold flu, which is why it’s very important to mind how they are exposed to cold weather because it’s definitely going to make breathing well an issue for them. My little niece had a catarrh a while because of being exposed carelessly by her nanny but she is quite alright now after some medication. Bringing the kids to crowded places can be one of the easiest way they could contract some of those respiratory ailments and I have to say that parents should be careful of where they take their kids to in order to protect them from cold, flu and other common ailments during the winter period. I totally agree with you on this @Henrywrites, I would know how important going to such places are that would warrant taking my little one to such places, take for instance, a hospital. I barely take them to shopping mall and I have this behavior of not allowing them to be carried or touched by just anyone.